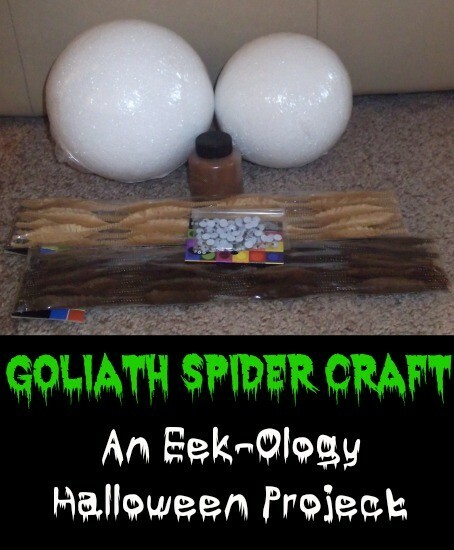 Goliath Spider Craft Eek-ology for Kids! When Little Man and I came across The Orkin Ecologist site we were thrilled! There are so many neat images and videos to be found on their website and we had a ton of fun looking at pictures and learning new things about bugs. We enjoyed it so much we did a craft inspired by it! After looking at photos of the Goliath bird-eating spider, we decided to make a giant spider craft of our own. I had to drag Little Man away from the computer an make him stop looking at the photos. He was so enthralled by it! When he heard the word “craft” though, he got quite excited and soon got into building his own spider with me. Our first step was the paint the styrophoam balls. They tend to soak up the paint, so be sure you have more paint than you think you will probably need. We had to make a second run to the store to buy some more brown paint! We let the paint dry over night and then got back to work finishing the spider. Using a toothpick we connected the two balls to form the body of the spider. Next, we attatched all eight legs to the front portion of the spider. Since the balls are made out of styrophoam we were able to just shove the pipe cleaners directly in to the spider’s body. 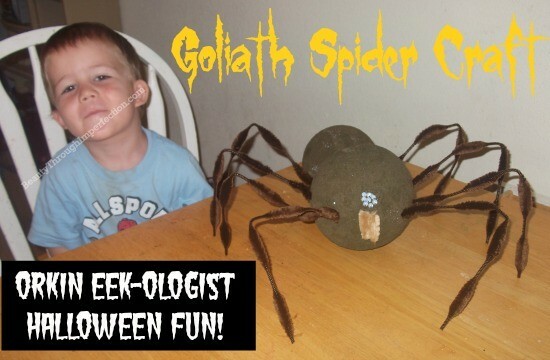 Next, we cut up a light brown pipe cleaner and used two pieces as the huge, inch long fangs that the goliath spider has! We used glue to attatch the fangs and also to secure 8 tiny eyes above the fangs. Little Man was fascinated by the number of eyes and legs the spiders have! Our finished project was almost as big as Little Man! We found out on the Orkin site that the goliath spider has a leg span of almost a foot long! We were even able to watch videos of the spiders crawling around and even saw one eating a mouse! It was amazing. I always love it when we can make learning fun, so I was really happy to find out about the Orkin site. My son has asked to go back to look at more pictures several times, and I’m sure we will be visiting the site a lot in the future. I loved that it was useful for kids of all ages. My 2 year old could enjoy the photos and I could read to him facts that were at his comprehesion level, but then I also found many pages that were perfect for an older child. I learned a lot on the site myself,(like that the bite of a taratula wouldn’t be any more painful to a human than a bee sting!) it was all very fascinating. They feature a different bug each month, and share lots of interesting facts all throughout the month! Yay for educational fun! What do you do to make learning fun for you kids? If you visited the Orkin site, what was your favorite part? 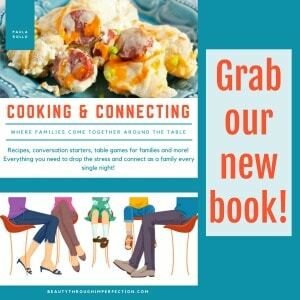 Thanks for sharing at Whimsy Wednesday last week! 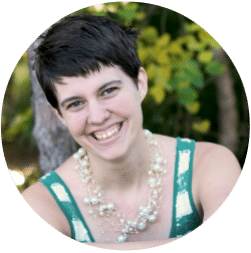 I featured you in my roundup today! 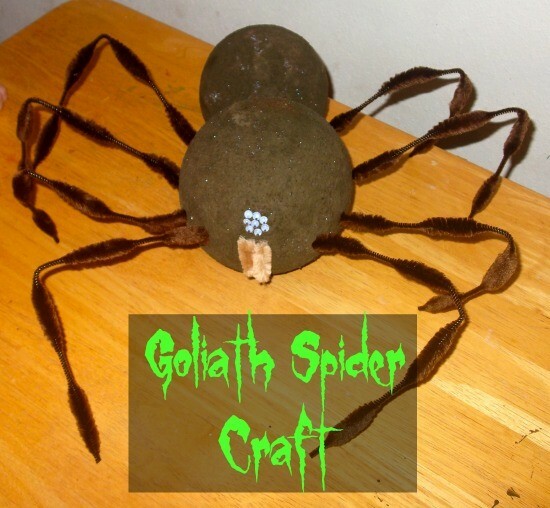 Hey Buddy!, I found this information for you: "Goliath Spider Craft Eek-ology for Kids!". 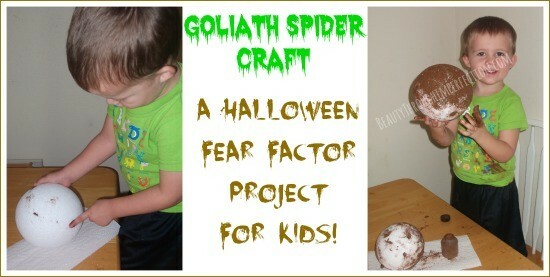 Here is the website link: https://www.beautythroughimperfection.com/goliath-spider-craft-eek-ology-for-kids/. Thank you.